South Coast Recycling & Scrap Metal Co (incorporating South Coast Bottle & Can Co) is a family-owned business offering recycling depots for in three Fleurieu Peninsula locations: Victor Harbor, Goolwa & Yankalilla. As well as offering cash for deposit bearing bottles and cans at the three depots, we also offer cash for a wide range of scrap metal items. 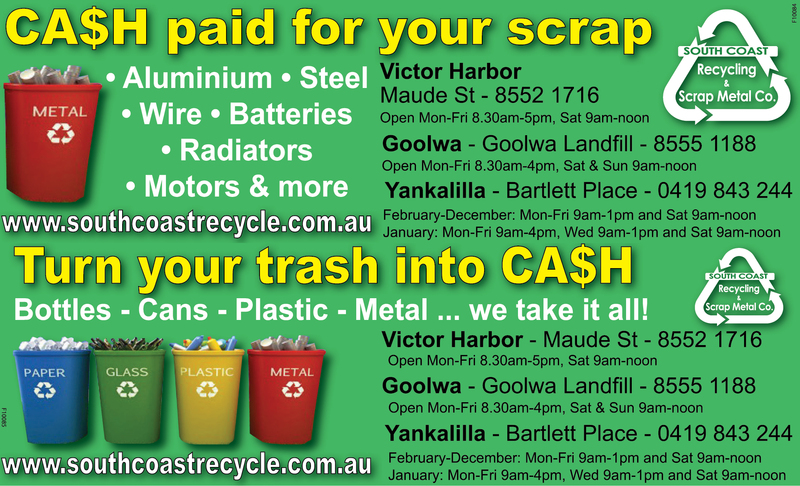 The latest prices for these can be found on our website www.southcoastrecycle.com.au.